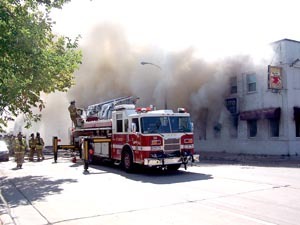 On Tuesday morning, July 17, Riverwest lost an iconic building, irreplaceable art, galleries, apartments, jobs, and an anchor business to a sudden fire in Joe’s East Coast Car Shop. The five-alarm fire raged on a sweltering 90 degree day at 631 E Center St. The blaze began after a light fell and sparked with a vehicle’s fuel tank. As soon as she heard, “Fire!” Jan Conley, shop manager, called 911 from the office, but the phone line was already dead. She ran out of the office and called 911 on her cell phone as she was dashing out the door. All the employees and residents got out in a hurry with only the clothes they were wearing. At the request of the Fire Department, WE Energies cut a power line to about 4,100 customers so the fire could be fought safely. Streets were blocked off and buses re-routed around Center Street. Television news crews and helicopters kept everyone informed of developments via the internet and TV, at least for those who still had power. Gutters of nearby houses overflowed with water as firefighters wet down houses on Booth Street as a preventive measure. Water flooded Center Street, and some residents are still mopping up their basements. More than 100 fire fighters were on the scene; two suffered heat exhaustion and were treated at Columbia St. Mary’s Hospital. The fire was under control by 2:30PM, but some flare ups occurred the next day. The building was home to The Green Gallery West, American Fantasy Classics, and Center. About two dozen artists have lost a lifetime of art; some had work all packed and ready to be shipped out for a show. The value of the art lost is estimated at over a quarter of a million dollars. Seven employees at Joe’s East Coast Car Shop are now out of a job: Frank, Jan, Hector, Jose, Jerry, Fuzzy and James. The Fix Family was devastated by the loss of Joe Fix last year after a long battle with cancer. Joe had operated the car shop for nearly 20 years. Jan, Joe’s sister, was managing the shop. She and Frank, Joe’s son, both lived in apartments in the building. Frank, whose apartment was located directly over the area where the fire started, lost everything. Jan has lost her job and her car (it’s still in the burned out shop), but she only lost half of her possessions because she was in the process of moving into a house she had just purchased and closed on the Friday before the fire. Portions of the 25,000 square foot building and roof collapsed during the fire. The Department of Neighborhood Services has condemned the building and issued a raze order. While the fire burned, the Riverwest community and MARN (Milwaukee Artist Resource Network) went to work setting up relief funds and spreading the word via social media. Collections of food, art supplies, bicycles, personal items, household goods, and gift cards were underway the weekend after the fire at several Riverwest and Bay View locations. Donations to assist all affected workers, artists, and residents may be sent to “RNA Relief Fund,” RAA Jazz Gallery, 926 E Center St, 53212. Opinion – Can We All Get Along?